In today’s lightning-paced world of cybersecurity, an organization needs more than a strong IT team to protect its assets. It needs a deeply rooted culture of cybersecurity prominence that starts at the top. Savvy executives are increasingly taking the cyber wheel with courses like the Executive Management Workshops offered at Regent University’s Institute of Cybersecurity in Virginia Beach, Virginia. This intimate and informal one-day workshop is designed to demystify cybersecurity threats for corporate, government and military leaders by providing in-depth coverage of how to understand, measure and manage the risks their enterprises face. Regent’s world-class instructors explain common cyber terms, jargon and definitions codified by the National Institute of Standards and Technology (NIST). They also guide students through careful examination of the attack process, the potential business impact of attack and how to determine what information is critical to protect. More than just defining the terminology and concepts of cybersecurity, however, Regent’s instructors show executives how to apply them to their organizations with a comprehensive risk-management plan that employs the tools and techniques recommended by NIST to prevent, respond to and recover from cyberattacks. Trainees are also introduced to the associated laws, regulations and policies regarding reporting compliance. Ryan Leirvik, principal with cyber industry leader GRIMM, is a workshop facilitator who says Regent’s executive cyber training provides a solid foundation in enterprise risk management, giving attendees proven models to take back to their organizations, regardless of their industry. Regent’s executive workshops are structured like board-level discussions with 10 to 14 attendees. Leirvik employs the Socratic Method to engage trainees and enrich course modules based on industry best practices. The day begins with a real-world case study to introduce the concepts of cybersecurity and to explain the ramifications of cyberattacks. Leirvik recently used the case study of the breach of a multinational organization that had just received its financial systems accreditation when the credit card information of millions of its customers was stolen. While the negative results were many, the immediate firing of the CEO was notable. Leirvik said the course is especially beneficial for leaders who overly rely on their IT teams without proper executive oversight. “Every executive needs to understand how cybersecurity risk fits into the enterprise. Regardless of the strength of their IT team, they should ask themselves: ‘How prepared are we to respond to an attack? What’s my role should an incident happen? Who do we need to contact?’ That’s where the rubber meets the road. When your organization has been breached or suffered a large-scale security incident, how you react and how quickly you react makes all the difference,” he said. After attending Regent’s executive one-day cyber training workshop, executives return to their organization with the knowledge to prioritize its cybersecurity structure and resources and to create a five-year strategy based on what they learned. Regent University’s Institute for Cybersecurity, home to one of the nation’s most powerful and agile commercially-facing cyber simulation range, is dedicated to closing the gap between classroom theory and practical, real-world proficiency. 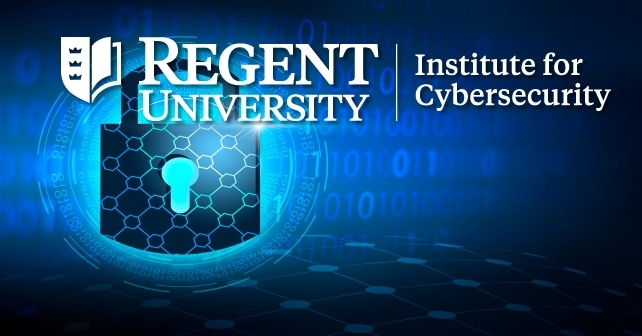 Regent offers a series of courses under the Certified Cyber Practitioner™ (CCP™) program with the option to earn the CCP™ certification, range training using live-fire simulations, plus associates, NSA-accredited bachelor’s and master’s degree programs in cybersecurity. Regent’s Institute for Cybersecurity is disrupting and transforming the cyber defense industry with a state-of-the-art training platform and world-class trainers. To learn more about Executive Management Workshops, the CCP™ program and other cyber training opportunities, visit regent.edu/cyber or contact the institute at 757.352.4215.